Boston Harbor cruises and tours offer you a fun way to appreciate the city's most important historic sites, see the Harbor Islands, and enjoy city skyline views from the water. If you have a special maritime interest, such as lighthouses or tall ships, Boston probably has a cruise that specializes in it. In addition, other cruises offer added entertainment, such as gourmet lunches and dinners, music and dancing, sunsets and romance. Most Harbor cruises last from about 45 minutes to 2 or 3 hours. This means that even if you only have a small amount of time, you may still be able to fit one into your schedule. 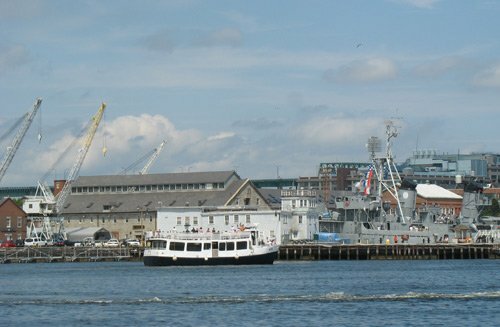 Many Boston Harbor cruises depart from convenient downtown wharves, while others leave from nearby Fan Pier across Fort Point Channel, easily reached by walking over the Moakley Footbridge. What Boston Harbor cruises can you choose? The city's oldest and largest cruise company is the aptly named Boston Harbor Cruises (BHC), whose boats have been plying New England waters since 1926 - except during World War II, when the founder served as a U.S. Navy Seabee. 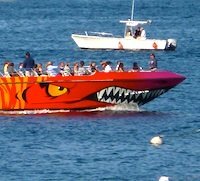 With some smart planning, you can get tickets for Boston Harbor cruises for less than half the regular price, plus get the same savings on 50+ other local attractions, cruises, tours, etc - plus a free bonus attraction, such as a Duck Tour. The trick? Easy - just get a GoBoston Card sightseeing discount card to lock in your savings and get your Boston vacation entertainment for half off! 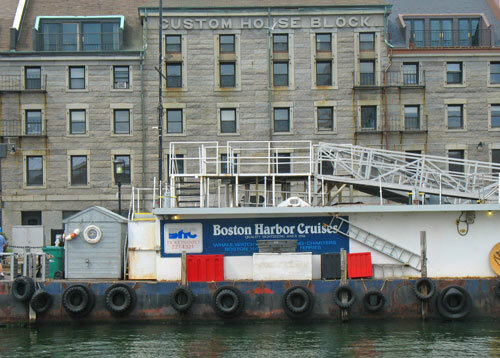 BHC is now the largest private operator of passenger vessels in the United States, as well as in Boston. You'll see their cruise boats everywhere! 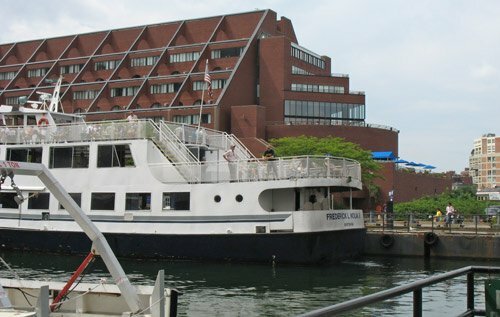 BHC operates many of the most popular Boston Harbor cruises, all of which leave from Long Wharf, between the New England Aquarium and the Marriott Long Wharf. Here are several harbor cruises ranging from sedate to wild to consider. This 90-minute tour gives you a great overview of all of the historic and current highlights of Boston's Inner and Outer Harbors. In addition to fabulous city views, you'll the nation's oldest continously manned lighthouse on Brewster Island. You'll also see a number of the other Boston Harbor Islands - in fact, you'll probably see some of the Harbor Island and whale watching cruises go by in the distance. The tour guide talks about everything from the Revolutionary War to local sea legends. You'll get a good view of the Port of Boston, which is actually quite impressive, as well as some of the city's most expensive waterfront condos - also quite impressive! If you're touring Boston for the first time, this is an excellent tour for you because you get lots of information on a variety of topics that will enhance your enjoyment of the city - and you get to see some wonderful Boston sites. Even if you live here, you'll still probably find the tour guide's information interesting - and the views spectacular! If you only have a little time - or if you're fascinated by old warships and nautical history - this 45 minute cruise will be perfect for you. 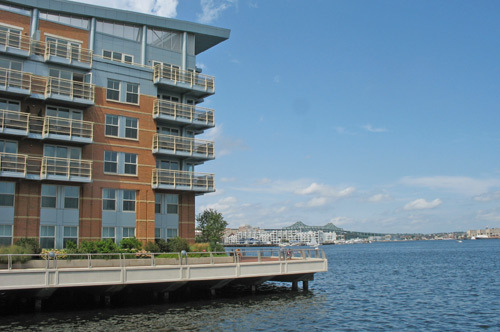 The cruise boat goes up around the city's North End, where you can fantasize about moving into one of the luxe waterfront condos or more affordably, decide that your next Boston stay must be in the to-die-for-fabulous Battery Wharf Boston Hotel. But don't let your fantasies interfere with your listening, because the cruise tour guide will be telling you all about the nearby Revolutionary War sites, such as Old North Church and Bunker Hill. Once the cruise boat reaches Charlestown, it pulls up right beside the USS Constitution (nicknamed "Old Ironsides"). If you want, you can get off the cruise boat and join one of the free ship tours or visit the (free) Charlestown Naval Museum. Take a ride on the wild side . . . Codzilla! Thrill-seekers, teenagers, and lunatics love Codzilla. If there were an award for "Wildest Boston Harbor Cruise," Codzilla would win, hands down. If you're more into sensation than sightseeing or just looking to have some fun, this Boston Harbor cruise is the ride for you! What other kinds of cruises can you take? Some Boston Harbor cruises use recorded narratives, while others have a real person acting as "tour guide" (sometimes doubling as the boat's captain). If real vs. recorded matters to you, check with the cruise company ahead of time about the specific cruise that you're planning to take. Open: Varies, depending on the cruise. The USS Constitution cruise runs from early April through late November - or even later, depending on the weather. The others start later and end earlier. Cost: Varies - most range from around $17 to $28 (plus tax) for Adults. Somewhat discounted prices are available for Children 4-12 and Seniors; Children under 4 ride free. For more information and tickets: Boston Harbor Cruises: 617-227-4321; website; you can also buy tickets at BHC's kiosk at Long Wharf where the cruises depart, and on-line here.